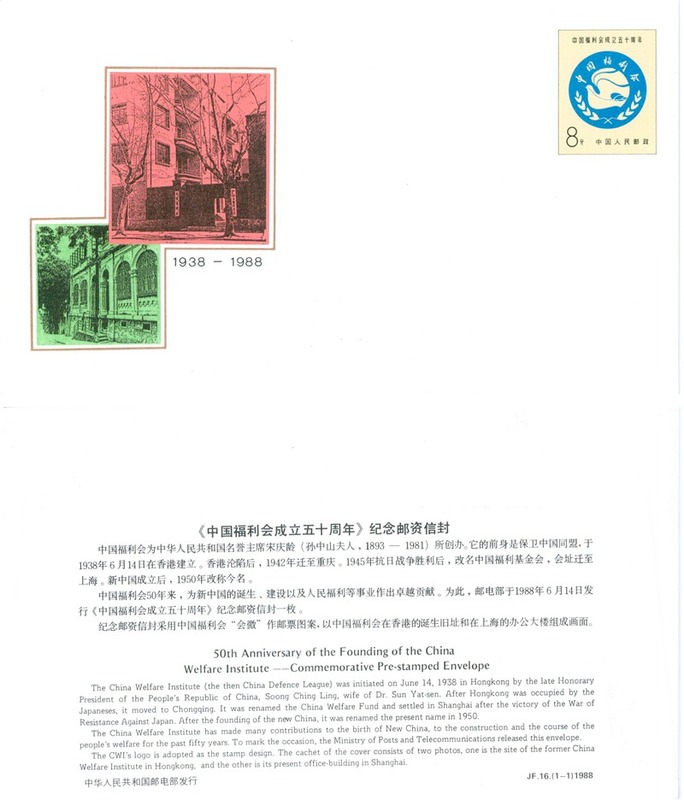 JF (Commemorative Stamped Envelopes), China. 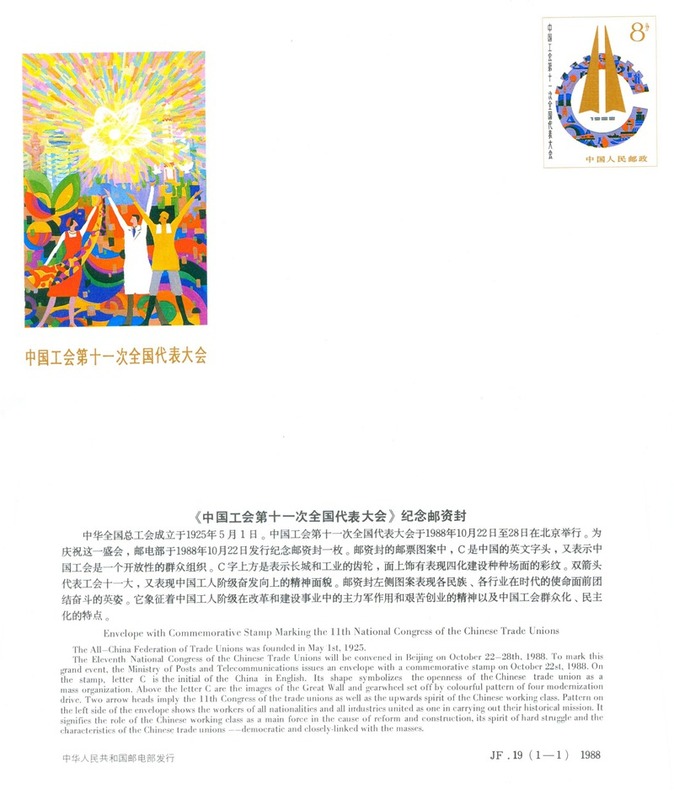 China first issued JF (Commemorative Stamped Envelopes) in 1982. That is JF1 "Namibia Day". 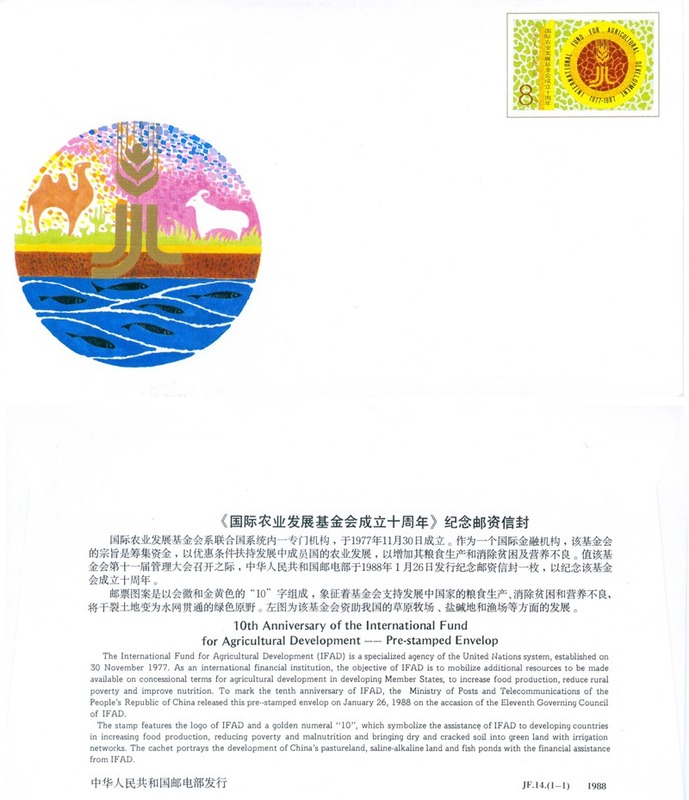 And up to the end of 2010, JF98 "Anniversary of China's Aid to Foreign Countries" was issued. 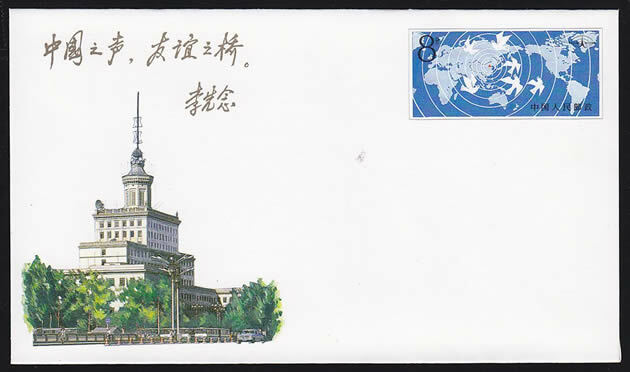 JF1, Namibia Day 1982 (P.R.China First Postal Envelope). UNC This is the first JF issued by P.R.China. Scarce currently. Only 200,000 pcs was issued. 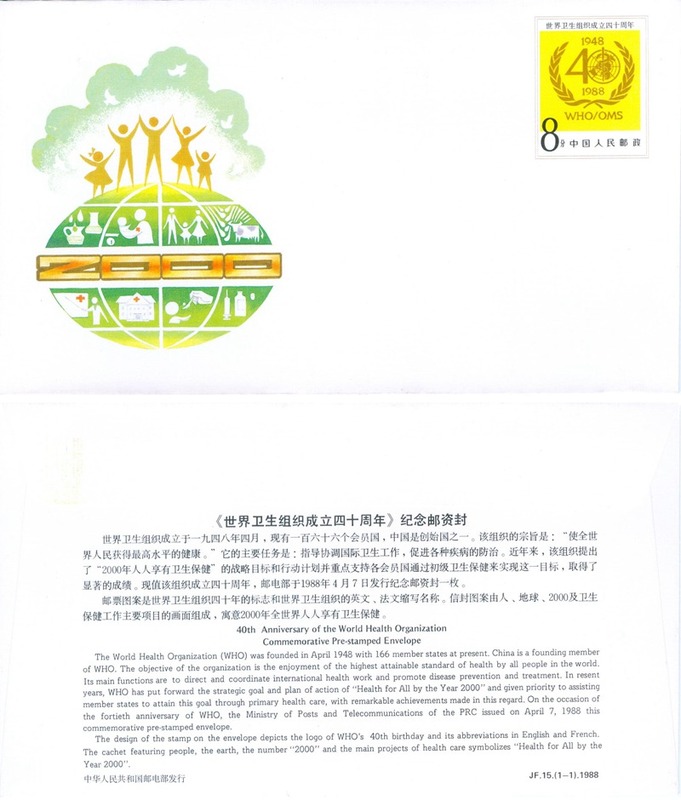 JF2, World Assembly on Aging 1982 (P.R.China Second Postal Envelope). UNC. 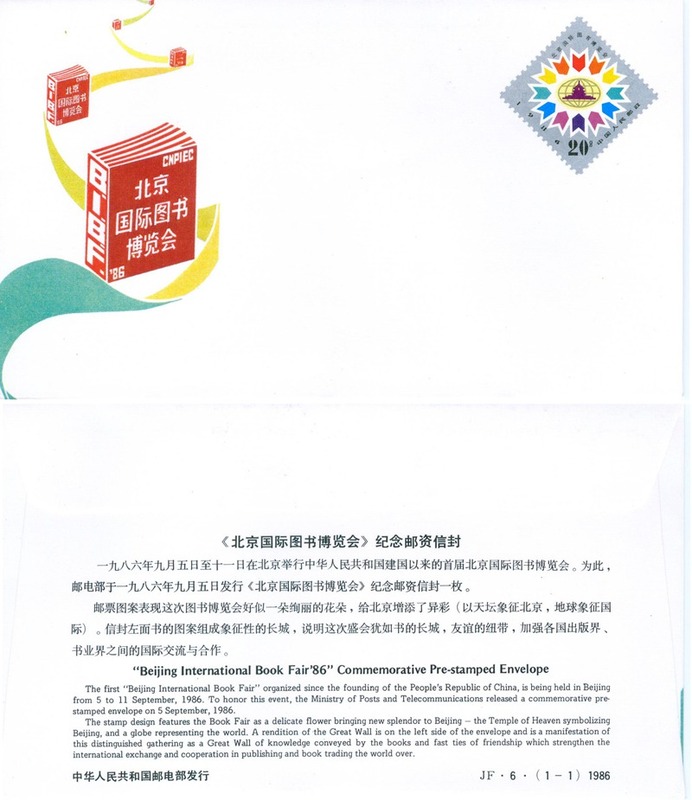 This is the second JF issued by P.R.China. Scarce currently. Only 200,000 pcs was issued. 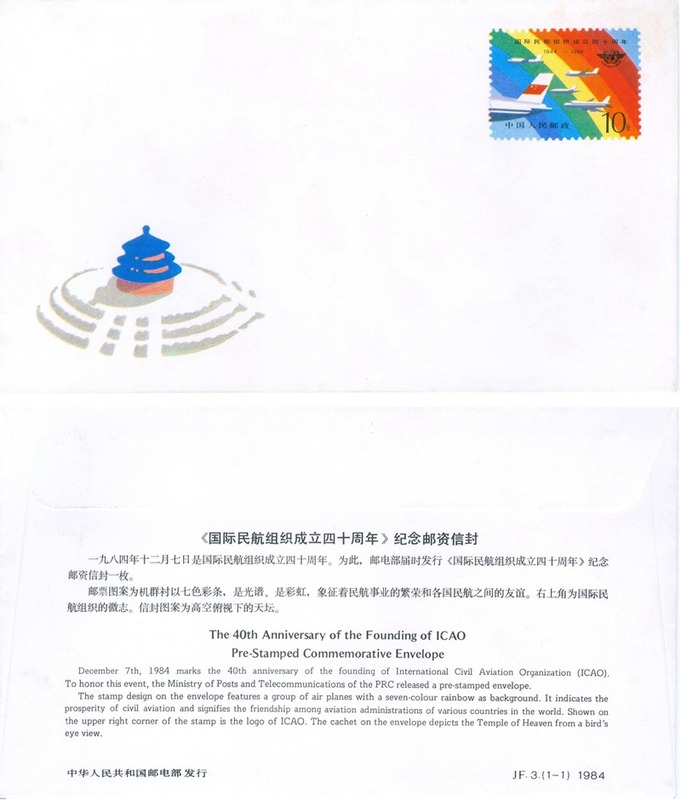 JF3, 40th Anniversary of ICAO 1984 (P.R.China Third Postal Envelope). UNC. This is the third JF issued by P.R.China. Scarce currently. 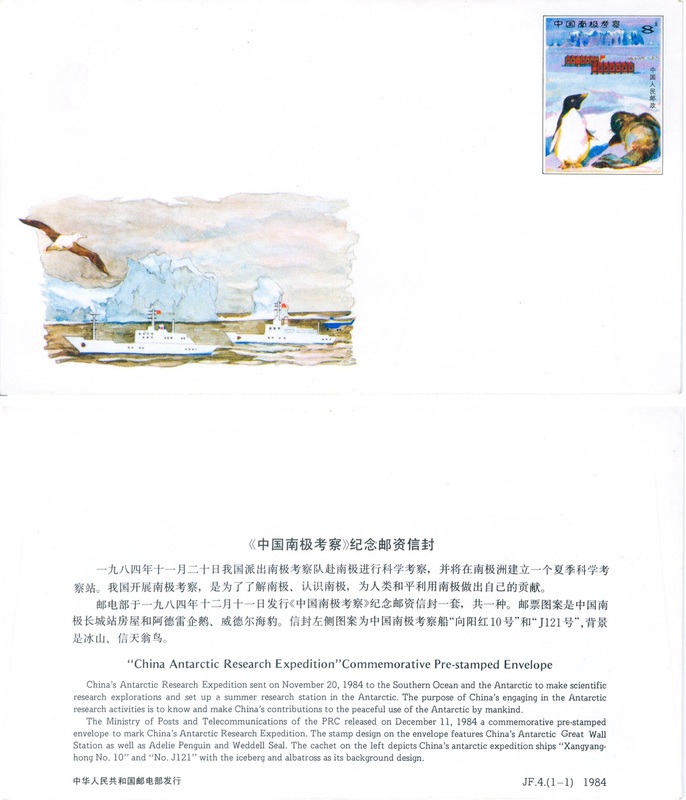 JF4, China Antarctic Expedition 1984 (P.R.China 4th Postal Envelope). UNC. This is the 4th JF issued by P.R.China. Scarce currently. 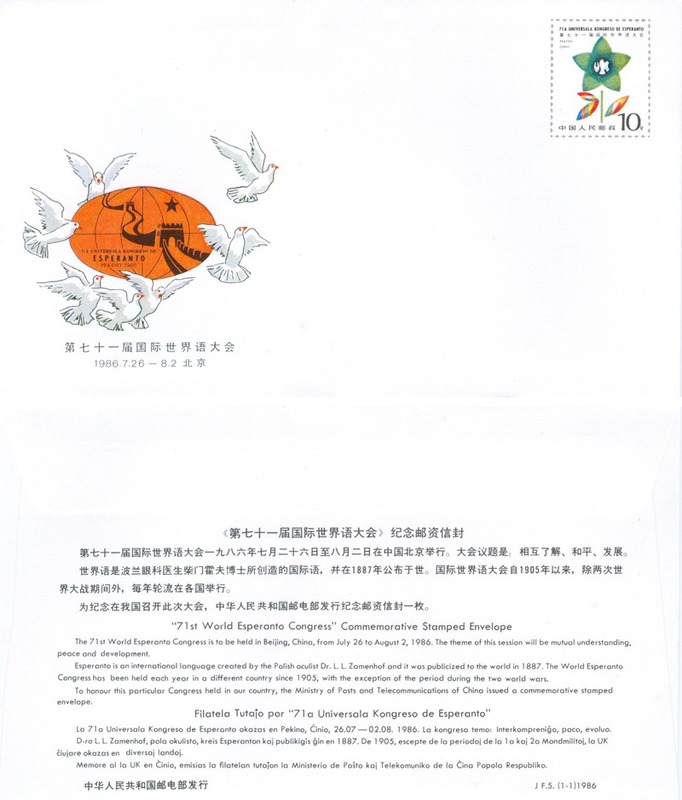 JF5 71th world Esperanto Congress 1986. UNC. JF6 Beijing International Book Fair 1986. UNC. 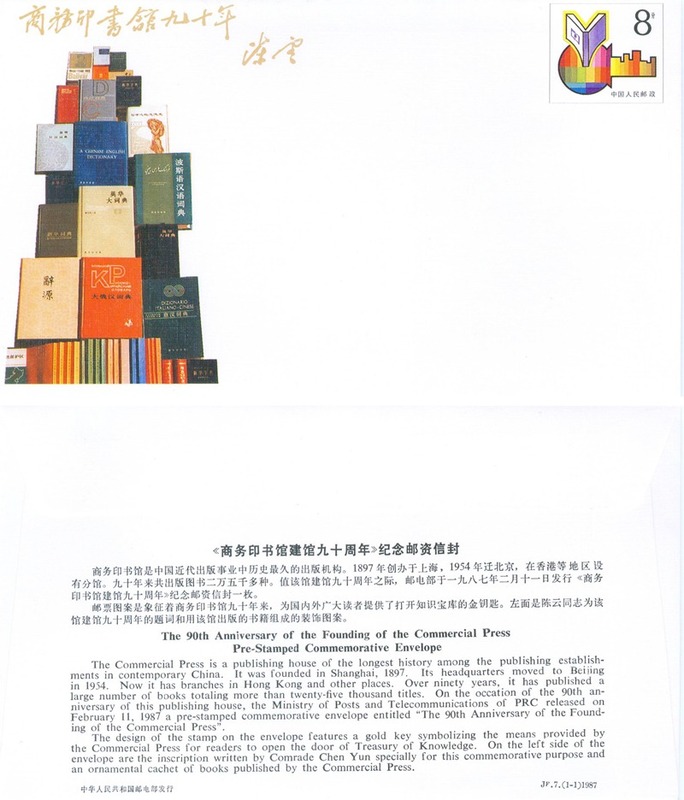 JF7 The 90th Anniversaryof the Founding of the Commercial Press 1987. UNC. 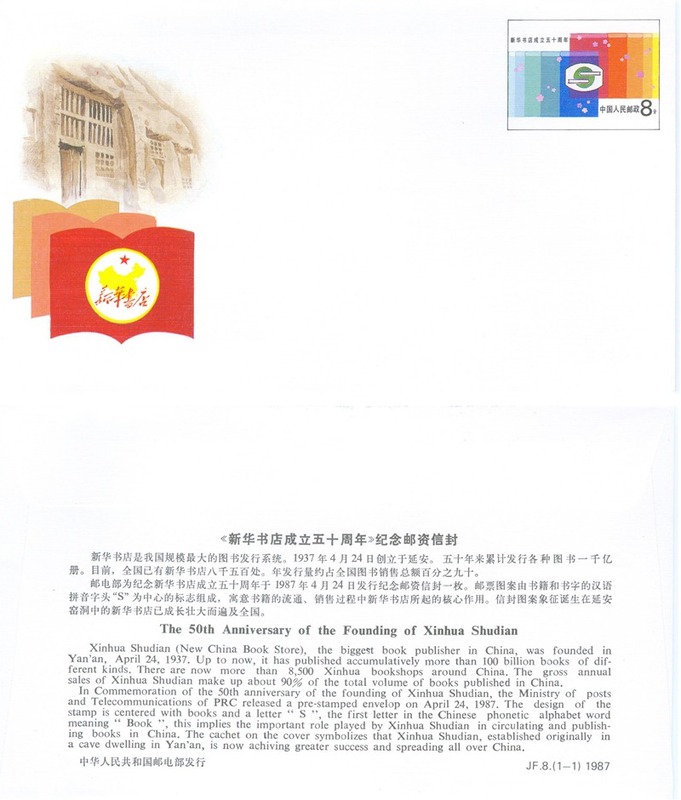 JF8 The 50th anniversary of the Founding of Xinhua Book Store 1987. UNC. 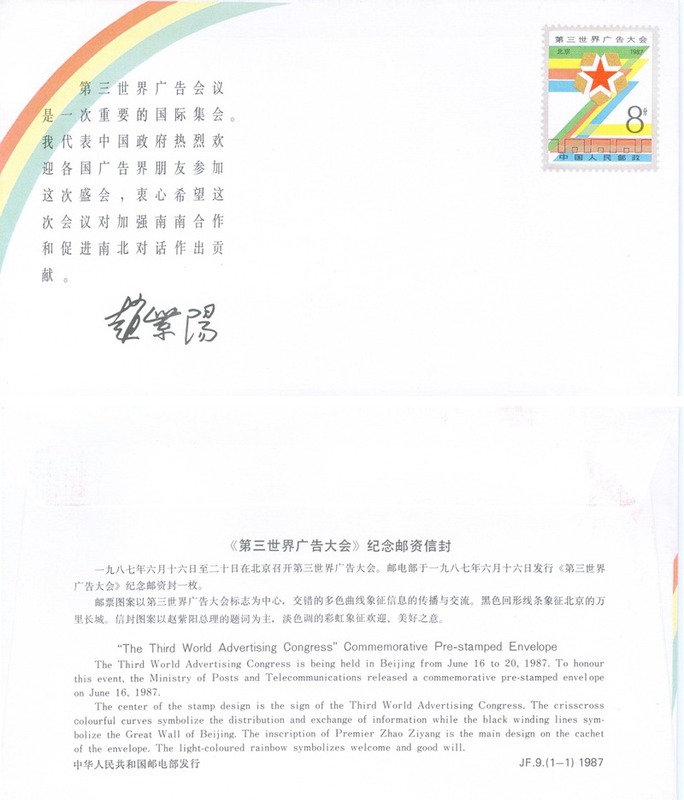 JF9 The Third World Advertising Congress 1987. UNC. 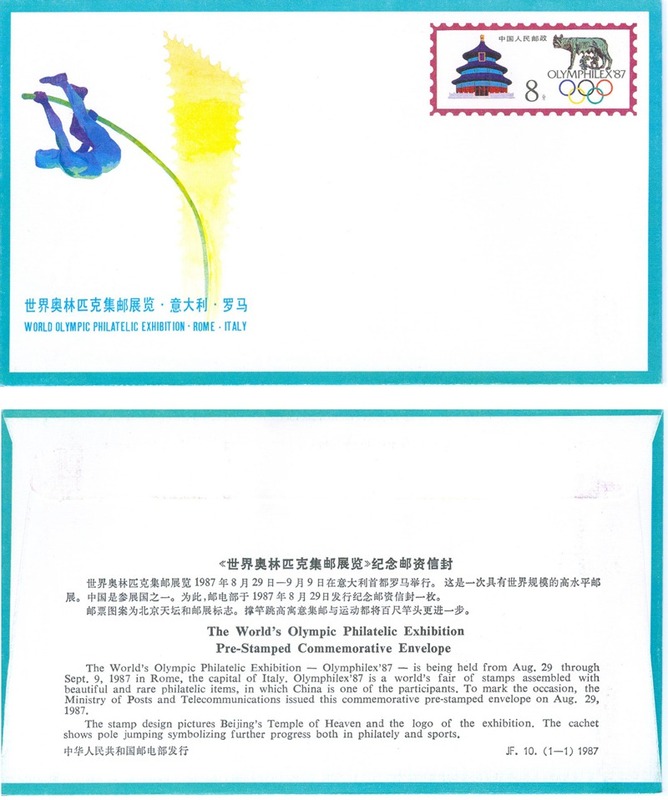 JF10 The World's Olympic Philatelic Exhibition 1987. UNC. 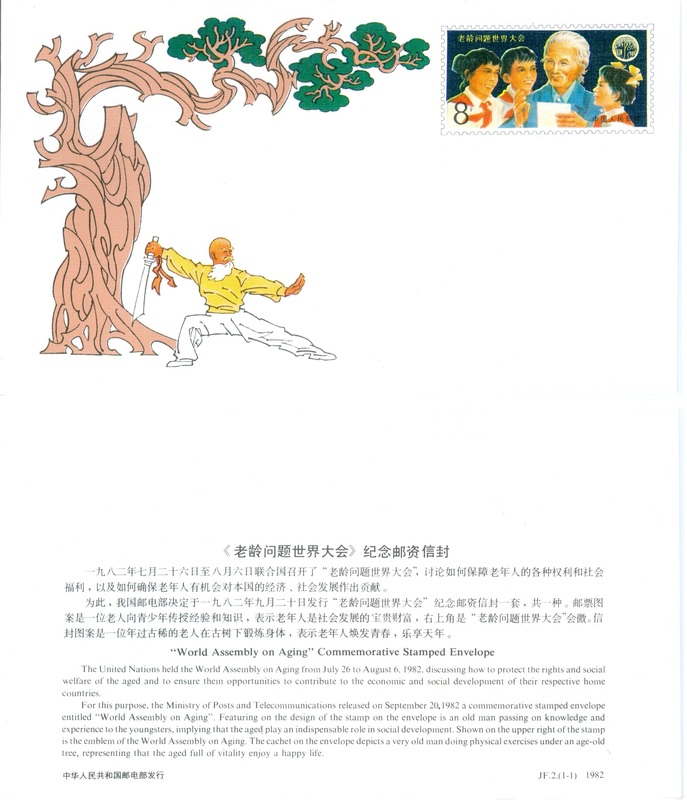 JF11 The 4th Anniversary of Radio Beijing 1987. UNC. 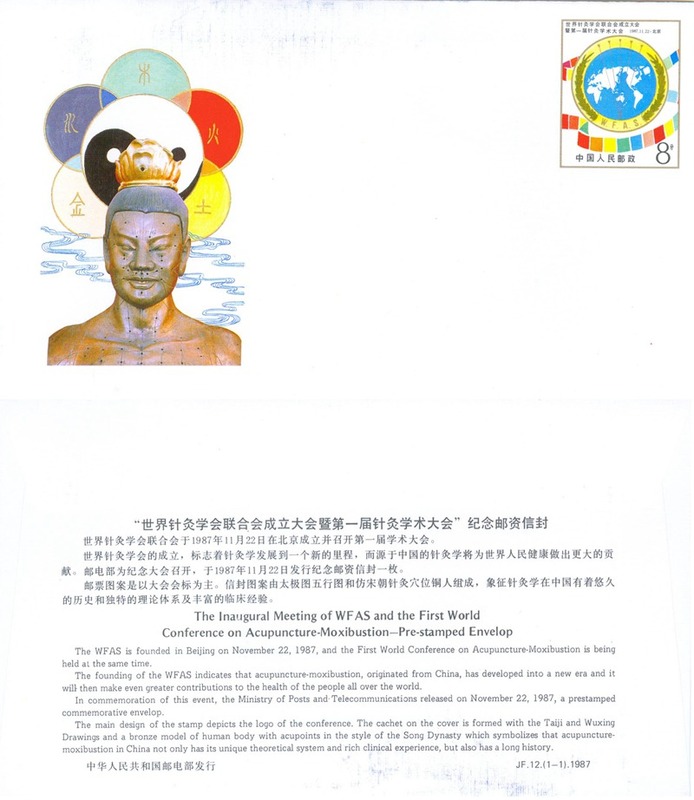 JF12 The Inaugural Meeting of WFAS and the First World Conference of Acupuncture Moxibustion 1987. UNC. 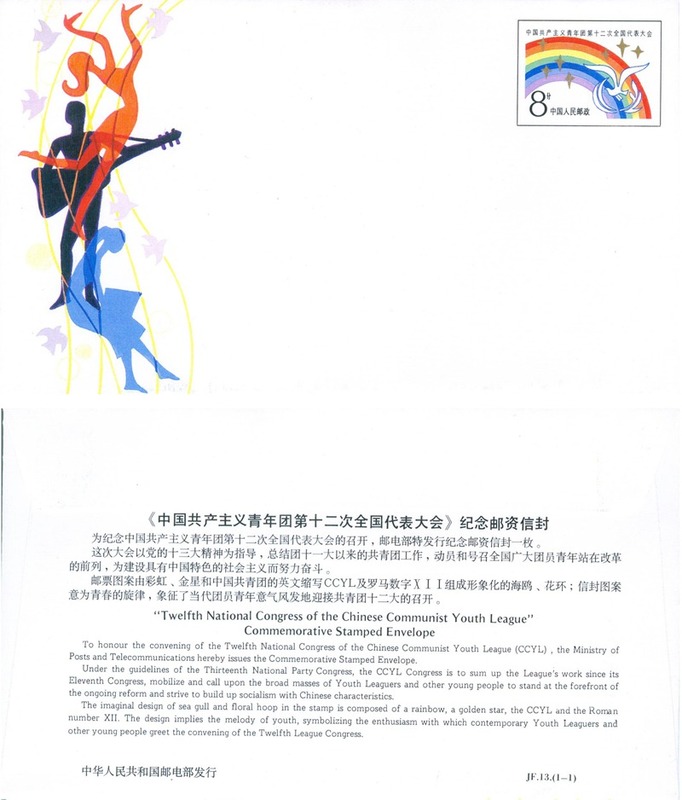 JF13 Twelfth National Congress of the Chinese Communist Youth League 1987. UNC. JF14 10th Anniversary of the International Fund for Agriculture Development 1988. UNC. JF15 40th Anniversary of the World Health Organization 1988. UNC. JF16 50th Anniversary of the Founding of the China Welfare Institute 1988. UNC. 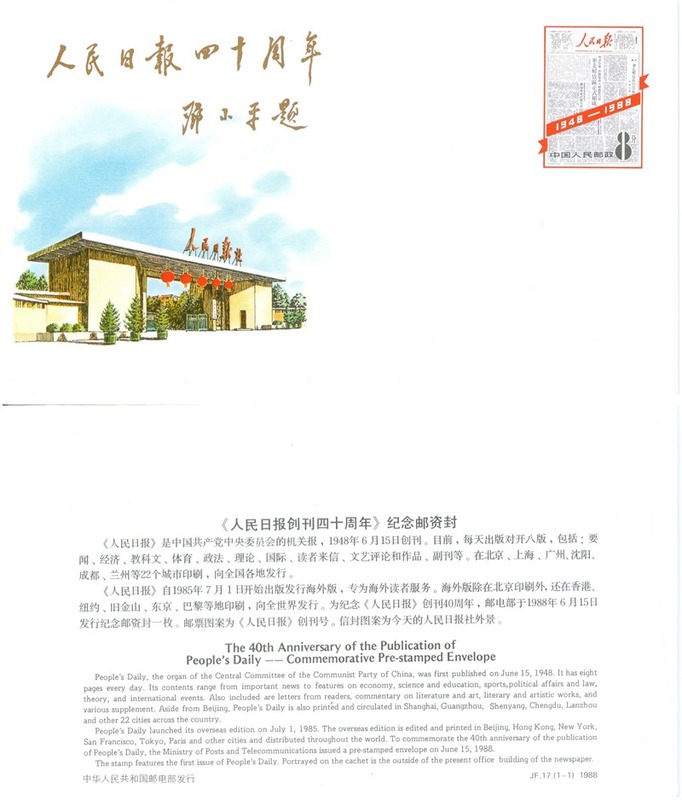 JF17 The 40th Anniversary of the Publication of People's Daily 1988. UNC. 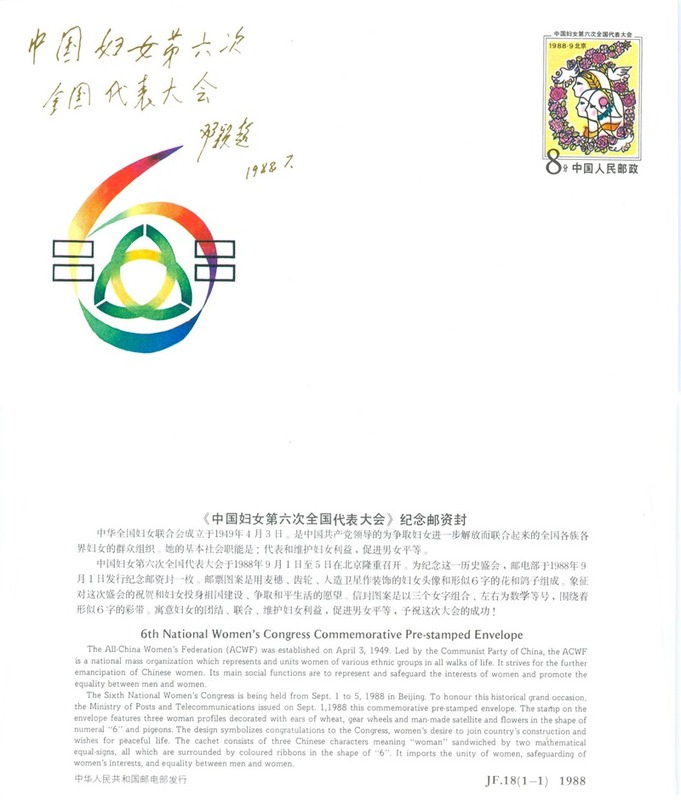 JF18 6th National Women's Congress 1988. UNC. 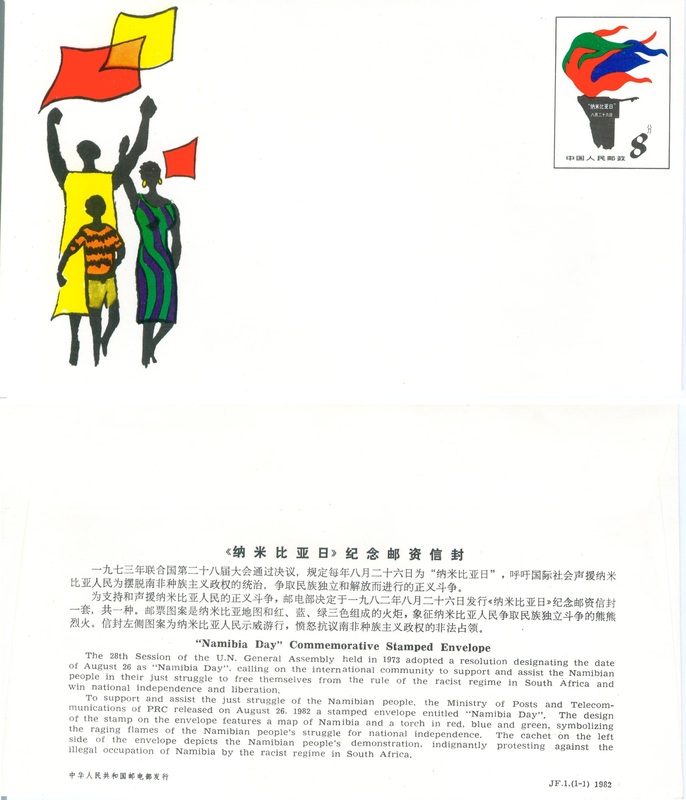 JF19 The 11th National Congress of the Trade Chinese Unions 1988. UNC. 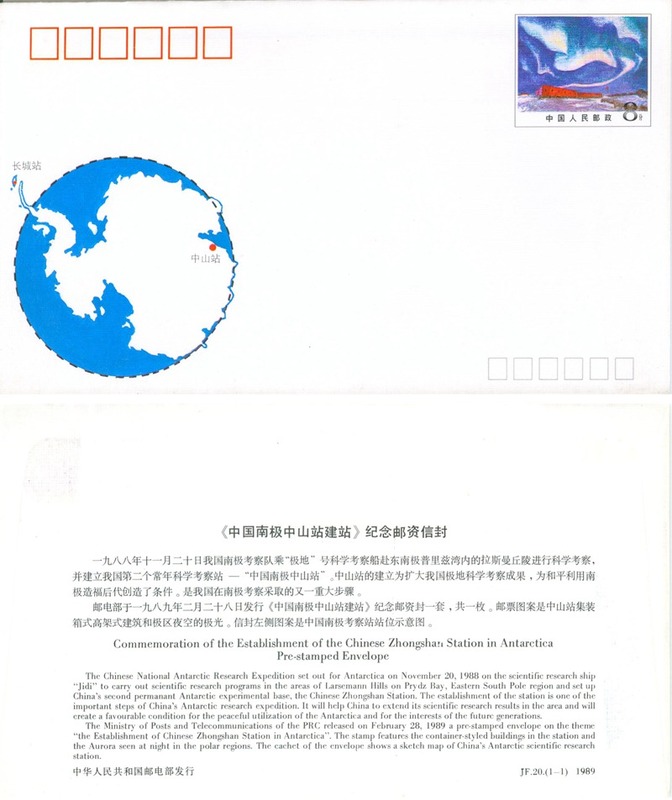 JF20 Commemoration of the Establishment of the Chinese Zhongshan Station in Antarctic 1989. UNC.